Hudson Valley for No GMOs: Leading GMO Critic Jeffrey Smith Speaking Monday at SUNY New Paltz! 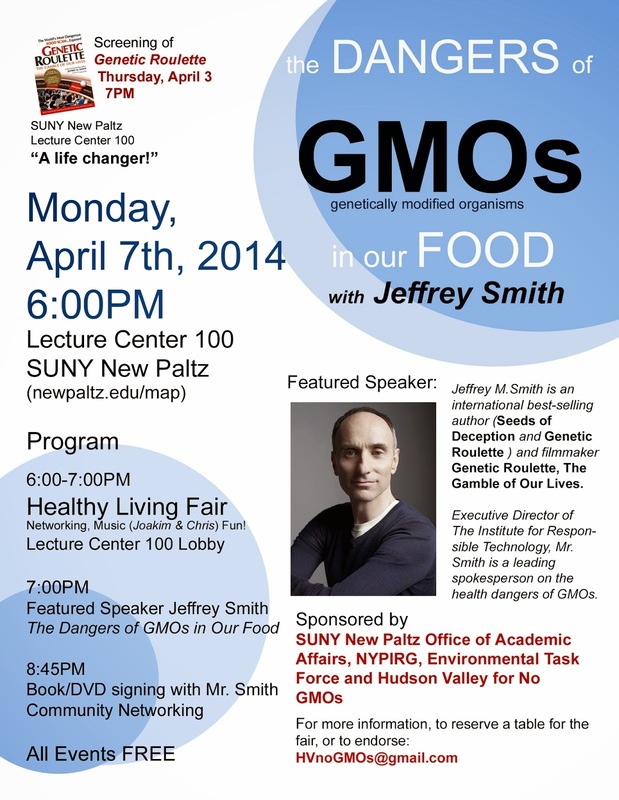 Leading GMO Critic Jeffrey Smith Speaking Monday at SUNY New Paltz! How lucky we are to be having the author of the world's best selling book on the health dangers of GMOs (Seeds of Deception: Exposing Industry and Government Lies about the Safety of Genetically Engineered Foods) coming to SUNY New Paltz on Monday! Mr. Smith has a wealth of knowledge to share about the dangers GMOs pose and how to avoid them to keep yourself and your family safe. Can you help us fill the house to overflowing? We actually have an extra room with live video, so we can hold 700. If you are on FB, sign up at The Dangers of GMOs in Our Food. Then go to our FB page GMO? OMG! Hudson Valley for No GMO and share this flyer on your page! You can also save it (right click) and send in an email to your lists. Make sure you tell folks to come for the Healthy Living Fair from 6-7pm. We'll have live music from the percussion and guitar duo, Joakim and Chris and organic treats from Gomen Kudasai! Local farmers, organizations dedicated to safe food and a healthy planet and wellness practitioners will be tabling. It will be a great opportunity to mingle, network and "shake the hand that feeds you"! Jeffrey Smith will speak at 7pm. Thanks for spreading the word so we can give him a warm, New Paltz welcome! Be sure to visit Hudson Valley for No GMOs at the Healthy Living Fair. We'll have a handy guide for avoiding GMOs and sample letters for you to sign to send to NYS legislators telling them you want GMO labeling in NY this year. Better yet, we'll provide simple points so you can write your own letter. Last year, we only lost by two votes. Let's make sure this year we make it all the way. As New York goes, so will go the country. Thank you! See you Monday! 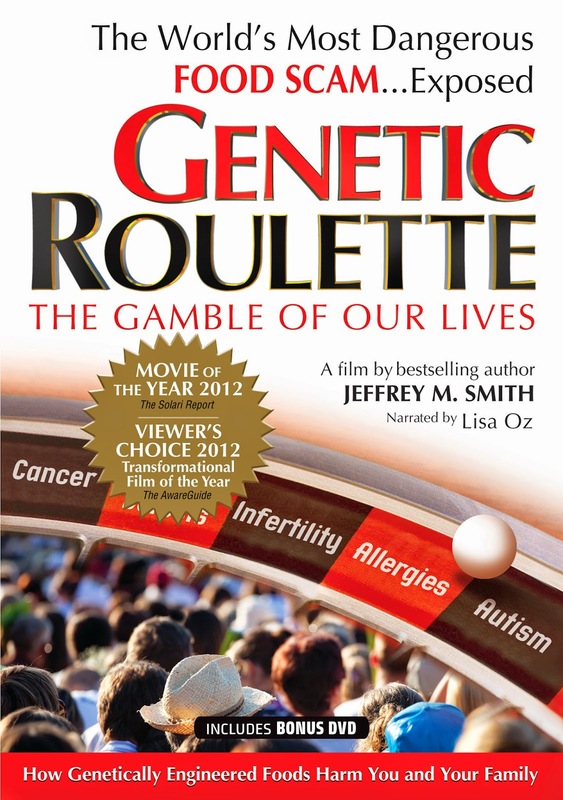 ps Thanks to the 115 who came out Thursday night to see Jeffrey Smith's "Genetic Roulette: The Gamble of Our Lives". Thanks for the good questions and and to Mike Boms, adjunct professor of biology at SUNY New Paltz and one of the organizers of Monday's event, who spoke about corporate abuse of power. Lastly, we are grateful to Tim Hopper and Emily Breen from the NYPIRG student group for opening and closing our event with aplomb and to Keron Lewis with Instructional Media Services.